A few new photos of Caitriona Balfe have been added to the gallery. First of all, I am so sorry for don’t update the site before but I was so busy with personal things. Caitriona Balfe attends the Virgin TV British Academy Television Awards at The Royal Festival Hall on May 13, 2018 in London. This Droughtlander has been one of the worst in recent memory for Outlander fans, more so for the scores of Diana Gabaldon‘s book lovers out there, because we know what’s coming next. Ok, I guess I should say we THINK we know what’s coming next, as it’s highly likely things will be changed for the upcoming 4th season of the STARZ series. 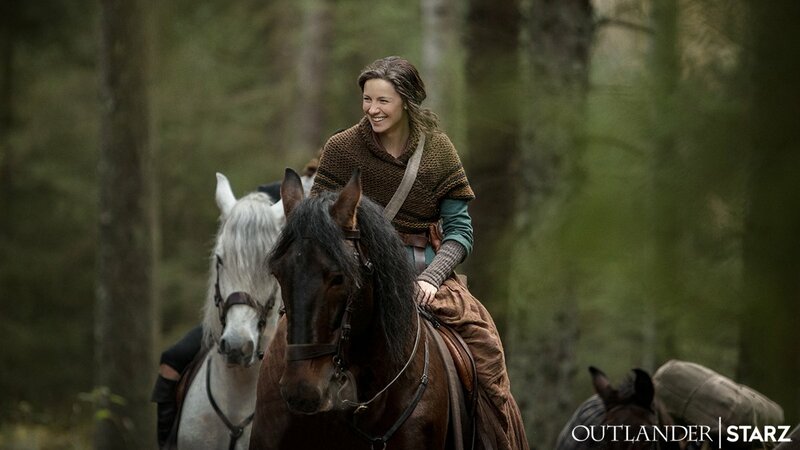 This morning the official Outlander twitter account posted a photo of series star Caitriona Balfe as Claire Fraser sitting atop a horse in a forest. “Caitriona’s smile is EVERYTHING,” the tweet read, and we have to agree with them. If you’ve ever been lucky enough to be in the same room with the Irish model-turned-actress, you know she really does have an infectious joyful personality, one that can light up a room no matter how dim. The downside of adapting books for the screen is that some key moments inevitably get left out because of time (rather, the lack of it) or to suit the creative flow. For Caitriona Balfe, who plays time-traveling leading lady Claire in “Outlander,” the omitted moments aren’t any less significant than what we see on the screen in finding her character. Taking a break from filming the fourth season of the epic drama, Balfe stopped by The Times’ video studio recently to reflect on the course-shifting third season that saw the show’s star-crossed couple coping with a life apart (for 20 years!) before eventually reuniting. The first five episodes of the third season work to establish how Claire and Jamie (Sam Heughan) settled into a life unhappily ever after. Jamie, back in 18th century Scotland; Claire in 20th century America, raising their daughter with Frank (Tobias Menzies) while taking up medicine. The third novel from the Diana Gabaldon book series, “Voyager,” did a lot to set up the journey Claire experiences in those years. Balfe said she infused the detail from the book that the script left out into her performance.